Below is an open letter to members of American government, press, and public. Hongyu Zhang is a woman living in Flushing, New York. My name is Hongyu Zhang. As a practitioner of Falun Dafa (aka Falun Gong). I fled China in 2014 to avoid being persecuted by the Chinese government for my faith. I am writing to ask for your help in rescuing my father. My father Ming Zhang (张明) lives in Dandong City in China’s Liaoning province. He was illegally detained by the local police on June 29, 2018 for trying to tell people not to discriminate against Falun Gong. My father has lived alone since 2013 when my mother passed away from the torture and abuse she received while in detention, also simply for practicing Falun Gong. I had spoken to him by phone in the morning of June 29, local time. When I called again on July 4, I was not able to reach my father. Repeated calls over the course of two days went unanswered, so I became worried. Subsequently I contacted my relatives and learned my father had been arrested. According to my aunt (my father’s elder sister), she received a call in the morning of July 1 from my father’s mobile number. The caller was a policeman from Kuandian, which is a city near Dandong. He told her to send some clothes for my father. When my aunt went to my father’s home, she discovered that the police had invaded his home, ransacked the place, and seized all of his books, identification, financial documents, and valuables. She was not allowed any contact with my father. People familiar with the situation reported my father’s arrest to Minghui.org, a website maintained by Falun Gong practitioners. On July 5, I found an Minghui article bearing details of his arrest. I am 31 years old. I began practicing Falun Gong with both my parents in my childhood. Everybody in my family received tremendous health benefits from this practice. I used to be a sickly child, but all of my ailments disappeared after I began practicing Falun Gong. My father used to drink and smoke, and he was also in poor health. Once he began practicing Falun Gong, his health improved; he quit all of his vices and became a better person. He has since been widely recognized by family and friends as a kind and honest person. My father used to work at Bank of China as a credit officer approving loan applications. In China, a position like this in a bank gave people many opportunities to earn “gray income”. My father never took advantage of these opportunities. When the Chinese government began to persecute Falun Gong in 1999, my parents were repeatedly arrested and sent to labor re-education camps, because they refused to renounce their faith. My father was detained for 6 months in 2000-2001. Upon his release, his BOC manager wanted to fire him, and asked my father’s co-workers to denounce him. None of them agreed, stating that he was an exemplary employee. In spite of this support, my father was still summarily dismissed. Since then, he has not able to find steady employment because the government would always exert pressure on his employer to fire him. My mother’s name was Jinqiu Xiu （修金秋）. She was first illegally arrested in 2004 but managed to escape from detention. After, she often had to live apart from our family, and we had to move constantly to insure her safety. 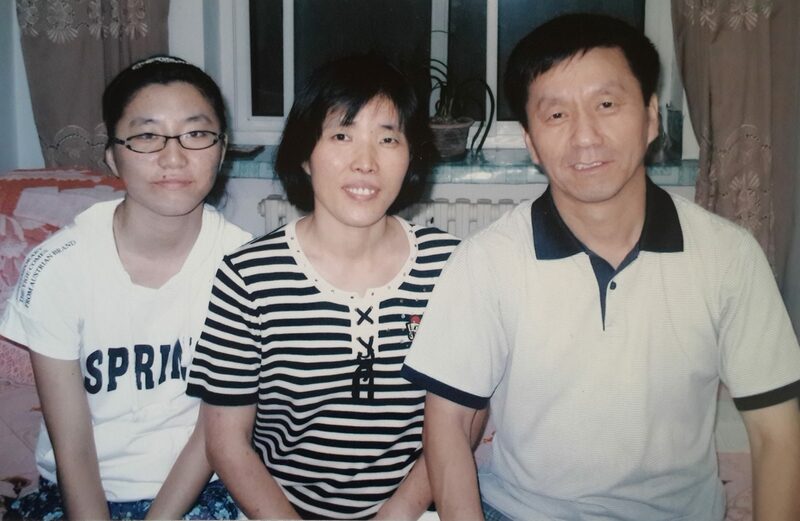 Unfortunately, the police illegally detained her again in 2007 and sent her to the notorious Masanjia labor re-education camp in Shenyang. Around the time that my mother was arrested, news had come out that Masanjia was a concentration camp where they murdered Falun Gong practitioners to harvest their organs for transplant. My grandmother was so worried her daughter that she temporarily went blind. At Masanjia, my mother suffered grave mistreatment, which resulted in her being diagnosed with dangerously elevated levels of glucose in her urine, ketoacidosis, and hepatic hemangioma. We worked hard to obtain “medical parole” for her, and only managed to do so after she had suffered over 3 months of mistreatment and torture. This detention had a lasting impact on the health of both my mother and my grandmother. My grandmother’s health declined dramatically, and eventually she passed away in 2012. Growing up with repeated harassment and frequent arrests, I lived in constant fear, always wondering if my parents would be at home to greet me after school or if they would be arrested just for following the Falun Gong tenets of truth, compassion and tolerance. In September 2013, local police once again illegally arrested my mother and exerted severe physical and mental pressure on her. As a result, she was paralyzed and became gravely ill in a matter of days. She passed away on November 28, 2013. At the same time, the police went to my father’s and my workplaces to harass us. My father lost his job and has not been able to find employment since then. After my mother passed away, my father and I decided that I should flee China to seek refuge. Since I arrived in the US, I have worked alongside my fellow Falun Gong practitioners here to tell the world about the evil that is taking place in China. The news of my father’s arrest has weighed heavily on my mind, because my family and I have not been able to communicate with him. I am again reminded of the final days of my mother’s life, the suffering she went through, before finally succumbing to death. Just this past year, the World Organization to Investigate the Persecution of Falun Gong (WOIPFG) has uncovered more credible evidence that the crime of live organ harvesting is still taking place in China. Over the past 19 years of China’s cruel persecution against Falun Gong, Liaoning province had been the center of some of the most egregious torture and abuse. Thus, I’m extremely worried and fear for my father’s life. I have already lost my mother to this inhumane persecution, simply because she refused to give up her faith in something that is truly good. I ask for your help to free my father from the same fate. I beseech you to contact the Chinese consulate to voice your concern on behalf of my father Ming Zhang, as well as the countless other Falun Gong practitioners who currently languish in Chinese prisons. I know your voice will have an impact and help to free them. Thank you for reading this letter, and I thank you for my father and my fellow practitioners for your righteous and kind act.